Wow, I can't believe I have been so busy with stamps (probably because my wife is away for a few days visiting the Grandkids). When she is away, I realize how boring I really am. I have been working on finishing up some of my smaller Albums which were at various states of completion. I have now posted three more on DCStamps. Korea, Japanese Offices (1876 - 1905) - I covered a short history of these stamps on the Dead Country thread. Foochow, China Treaty Port (1895 - 1896) - Foochow (today Fuzhou) was a designated Treaty Port established by the 1946 Treaty of Nanking after the First Opium War. Due to its weakness, western countries forced China to give up some territorial rights and open up specific cities (usually along the seacoast or navigable waterways) to be regions for trade. The commerce through these cities were run by "foreign-run Chinese maritime customs offices and municipal councils." Many of these municipal councils (such as Foochow) issued their own stamps for local delivery as well as delivery between the various treaty ports. Trans-Baikal Region under General Semyonov (1920) - General Gregory Mikhaylovich Semyonov, was a Japanese-supported leader of the White movement in Transbaikal during the Russian Civil War. After the fall of Admiral Kolchak in Siberia from Bolshevik forces, General Semyonov held a large part of the Trans-Baikal area with support from the Japanese. However, when the Japanese decided to withdraw from the region in July, 1920, Semyonov lost his support and was run out of the region in Oct, 1920. During Senyonov's occupation of the region, he surcharged 4 stamps from imperial Russia to be used for postage. OK, now what I need to do is to begin writing real histories for full entries on DCStamps for all of the albums I have been completing and posting. I already uploaded the album a while back, but now have written the history and published a proper page on the site. Check it out, and of course, comments are always welcome. A very interesting Puppet state of Japan, which issued some beautiful stamps. In fact, you can track many if the important events if this short lived country by following its Commemorative stamps. Also, I have and continue to add some new albums and album updates which I will list later. Note: some of the collections are quite interesting and unusual. (e.g. Kingdom of Hejaz). If you really want to see the stamps up close, click the link to the pdf at the top of the page. Haven't updated this thread in quite a while, but a lot has happened at DCStamps since then. I was going through a lot of old albums and pages this morning and I realized that I have reached two key milestones this month. First - it has been 7 years since I launched DCStamps and began publishing digital stamp albums of my collection on the site. (I think it all began on March 11, 2011). It has expanded far beyond my wildest dreams. Second - Last week I published my 200th digital album (Georgia SSR). All in all, that is more than 700 album pages. I want to thank everyone who has visited the site and have made comments and suggestions. I try to add a few new albums per month, as well as update the existing ones when I add new stamps to my collection. To celebrate, I will post a few select pages from some of the albums for your enjoyment. As always, you are always welcome to comment or offer suggestions, either here or at DCStamps. Here is the first page -- A fairly new one featuring stamps from the Czech Legion Army in Russia. What a pleasure to see your pages. You have given me a few ideas on what to do with my little collection. I have alwYs been. Interested in countries that no longer exist. Welcome to the lands of the dead. When you are ready, please share your ideas and how you were able to implement them. I love seeing how others collect dead countries. I will come back to this tread and site later when Im back from holiday. Had a breef look at your site and Im lokkong forward to look at it on a real pc and not on a my smartphone. Looks like grea work Dcstamps. I don't spend quite as much time before (as I am teaching part time now), but still try to do as much as possible - blog, new articles, stamp albums, etc. 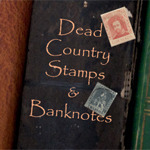 Just published a new edition of the DCStamps Investigator . It the 4th in a series of five articles I call Overprint Madness, where I discuss overprints and surcharges on Dead Countries. This one covers surcharges, which can often be complex to identify. In fact, some dead countries can only be identified by its overprint. It's nice to be able to see you pages from your own collection. Thanks for sharing them. I've just had a quick look at your Autonomous Crete pages as it's one of my favourite areas. - Your 1900 20 lepta stamp has a lovely strike of the first XANIA (Chania) postmark. It's a common postmark but this is a perfect example. I was amazed to learn just how many times the mail was picked up and processed each day in the main towns. On this example, the CDS is timed at 2-E, i.e. 2pm. So far I've found 11 different times in the day on Chania postmarks plus one with the 3-Π (3pm) slug inverted. I've read that the thee main towns' postmarks each have between 12 and 16 different times recorded. - Even more interesting to me is that your 1905 20 lepta stamp has a partial strike of the scarce KAΣTEΛΛION KIΣΣAMOY (Kastellion Kissamou) handstamp which by accident was created with the letter Υ inverted (as can be seen on your stamp). 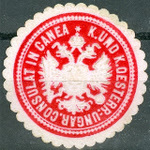 This handstamp was eventually replaced with a new one that read KAΣTEΛΛI (KIΣΣAMOY) with the letter Y the right way up up. I realise Crete postmarks are an obscure collecting area so thanks for your patience anyone who has read this far! I appreciate your insight on my humble Crete collection, and the postmarks. I too have always enjoyed the SOTN Xania cancel. Pretty thing to behold. Of course I never would have known about the KAΣTEΛΛION KIΣΣAMOY cancel without your analysis. In looking at the overprint "ΕΛΛΗΝΙΚΗ ΔΙΟIΚΗCΙC" -- Greek Administration, I note that a "C" is used in place of "Σ". By any chance would you know the origin, or anything about this font, and why the sigma is changed? . I have seen the font on a few Greek stamps such as Scott #509 below. That's a good question and Wikipedia gives a good answer. In handwritten Greek during the Hellenistic period (4th and 3rd centuries BC), the epigraphic form of Σ was simplified into a C-like shape. It is also found on coins from the fourth century BC onward. This became the universal standard form of sigma during late antiquity and the Middle Ages. It is today known as lunate sigma ... because of its crescent-like shape. It is still widely used in decorative typefaces in Greece, especially in religious and church contexts, as well as in some modern print editions of classical Greek texts. The forms of the Cyrillic letter С (representing /s/) and the Coptic letter sima are derived from the lunate sigma. The only Greek I have really seen much of is biblical (konie) Greek. My Greek is limited to a few hours of Ancient Greek in my last month at school many, many years ago. We learned the alphabet and had some fun translating strange sentences such as "the goddess looses the fetters". . I used to only collect dead countries which ceased to exist by the end of 1955. However, in 2016, I extended the year to 1959. There were two reasons - first, it seemed more logical to go to the end of a decade. However, the primary reason was that there were a few countries that extended a little beyond 1955 that I really wanted to collect. I just published the history and album of one of them -- Tangier. I Love a good spy story, and Tangier was such a haven for spies, smugglers and pirates. Since this was an international zone, the mail was managed by various individual countries - primarily Great Britain, Spain and France. If interested you can read the article: International Zone of Tangier, British Offices and see my Stamp Album here. This first publication and album only covers the British offices. Hopefully I will get to the Spanish and French offices at a later date.